In this Profrom 905 CST Treadmill review we are going to talk about this high-quality personal workout machine’s performance and features. So let’s get started. This Profrom 905 CST is pretty similar to the previous model Proform 505 CST. The size and frame construction of 905 and 705 is the same. But the first one comes with extra powerful motor, more exercise programs, and more weight capacity. Our Proform 905 is perfect for comfortable workouts. It has a large deck for a run or walks, fan to remain calm, cushioned handles, sound system, and other health programs. It’s made to keep your heart and healthy and at first glance seems like the treadmill is worth for the job. What Can Profrom 905 CST Treadmill Do? Using a treadmill is more convenient of walking on pavement especially on Profrom 905 CST Treadmill. You will understand the necessity of this machine day by day, the more you will know and use it. The deck and belt of treadmill cushion your strides. That is why it less impact on your ankle knees and hip joints then the traditional walking method. If you are an overweight person and want to have a massive duty workout machine, then this is it. This one can withstand 350 to 390 lbs not only that its sturdy frame let you use it for years after years. workout fan, etc. are an excellent addition of it. Plus, these features are useful in quality and performance. There are a few famous brand names when it comes to treadmills. And Profrom is one of them. The Entire running/walking machine the produced are assured you versatility and longevity. Usually, you will find a doable exercise machine in 300-500 dollars. But the working guarantee is 50-50. Professional treadmills are quite expensive. The brand ProFroms has walking or running machine in 500-1000 dollars. And the model, 905 cost 900+ dollars and perfect for any professional runner as well as amateur. However, let’s see what technical and physical features it has. The best walking treadmill by Proform 905 CST comes with a heavy-duty steel frame which around 200 lbs. This is quite a weight and plays a vital role in its overall strength and stability. The base has enhanced by the changeable levelers in its front platform. But weight is not a barrier to handle it easily. The deck is foldable and equipped with wheels in front for easy transportation. 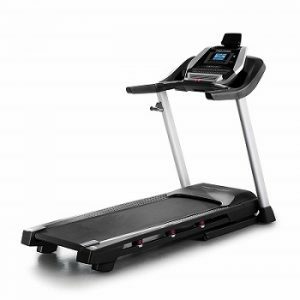 In addition, the frame of the treadmill is painted with black rust and chip resistant paint finish. The console poles are silver and look good with the black frame. There is no other color available on this machine. However, the side rail covers, motor cover and some other covers of the machine is made of ABS materials. That is the reason the overall machine reviewed an as long lasting product by its maximum users. As we said, this workout machine features a foldable frame which could be locked in an upright position by the latch on the left console pole. The length of the machine is lessening almost two-thirds when the deck is on locked position. However, there is no hydraulic assist system on it to unfold the treadmill. You need to lower yourself to open it. The treadmill takes around 79 by 37 inches of space. It recommends about three ft at the rear of the deck on your room space. And for upper space, it takes two and a half ft area. So, it seems to be pretty compact than other traditional walking machines. The machine also includes an industrial-grade rubber belt as a running surface. This 60 by 20 inches belt accommodated any user max 6 ft. by 5 inches and weighed max 360 lbs. This one promotes a neutral side and the proper leg extension to a tall and weighty person. Furthermore, the belt rolls over two precision machined crowned rollers (1.9 inches). These two crowns improve the grip of rollers and extend the durability of the belt. The ProForms CST 905 also offers the ProShox™ deck cushioning system which is also found in 505 CST model. It contains six spring cells in pairs and can reduce joint stress, more than 25%. That means you would feel less pain if you work on this kind of platform that 905 provide. Running and walking on this treadmill for a more extended period will result in more comfort on burning calorie with low joint pains on feet or back. The console of the 905 model is pretty simple. The display is 5” with Blue LED backlight and large digits for easy readability. However, the show covers all the necessary things like, time, distance, the number of vertical feet climbed, speed, calories, heart rate, etc. the console includes an intensity bar which indicates the intensity level of the exercise. For the exercise programs, the mid-section of the display has been used. The console shows miles and MPH settings in Metric units for speed and distance. The exciting option for seeing distance “My Trail” function. That shows or counts the distance as traveled as the race track of 400 meters and the completed laps. The consoles also can track your plus via the Bluetooth HR chest strap transmitter. Besides two EKG sensors incorporated in the front handlebars to track the heart beats. The exciting features of the console are iFit. It syncs the data from your tabs, smartphone or laptop. But you need to install the iFit app and account on those too. But the iFit membership is not included with the machine. As we mentioned earlier, the treadmill is concluded 30 different workout programs divided into four categories. And each category has its specific buttons. These four categories are Incline, Intensity, Speed, and Calorie. These are displayed as the segmented grid. One inclined setting and speed setting is programmed for each segment. When you are exercising, the profile name, speed, and incline tab show the progress. Additionally, the consoles integrated a cooling fan, a tablet holder and two accessory trays along with the sound system. This sound system includes two large speakers on each side of the units with audio jack input. You can play music by connecting your phone, iPod or tab and listen to songs via those speakers. The volume control setting is available on the control. Here we like to add one thing about the cooling fan. This fan is placed on the bottom of the unit and quite powerful considering its previous model. Also, it offers many power settings. The location of the tab holder is top of the console unit. The unit is matt and pretty broad to keep any size of tab or iPad. The accessory trays are located one on each side of the console which is large enough to hold water bottles or anything else but small in size. The Proform 905 model includes motorized inclined system. This system allows you to control it from the console only when it’s on. There is various onboard programs are installed in this console that uses in incline. Depending on the programs the treadmill could adjust the inclining automatically. In addition, the incline system is included a tiny lift which is under the front part of the deck. When, you tune the incline through the console controls it lifts gradually and elevated the front part of the base. This console makes 1% adjustment increments and 12 incline levels. You get two different types of incline controls on the console for fast and slow incline adjustments. The first one covers the entire 0-12% settings. The height of the deck or the running surface stayed around 8 inches high from the floor. If you position it in maximum height, then the height will be about 13.5 inches from the floor. So, we would suggest you install the machine in a room with a minimum of 20 inches extra ceiling height then your body height. The Proform CST 905 comes with 3.0 CHP industrial grades 3.0 CHP motor. This motor is good to support long-distance running exercises without giving a glitch or overheating. The motor equipped with a small flywheel which improves stability, lessen the vibration and let you walk or run on the belt smoothly. This motor offers .5 to 12 mph speed range. You have the option to control the speed either gradually or quickly. The console of the treadmill has some adjustment keys which let you adjust the resistance in increments 0.1 to 0.5 mph. The good thing is the motor is not that loud that could break your ear. It makes a little buzz sound when on but never interrupt the sound of tv or music forms the audio system. The treadmill comes pre-assembled. All you need to join the console mast and the console. The belt, drive, motors, cushions system, etc. are attached with the deck. But entering these console and pole requires more than an hour. You can get to this by following the instruction easily. Some necessary tools will need for this job. The belt of the machine pre-lubricated so you don’t need to apply anything for smooth movement for at least a year. For maintenance, keep the belt clean twice in a week. Use a wet towel to wipe the dirt and debris. Also, keep cleaning the side and under on the machine from time to time. The frame construction is pretty sturdy. It supports up to 350 lbs of weight frequently. The treadmill is foldable so, space savings also. Support If it and Bluetooth. High capacity motor with 12 mph speed. The EGK pulse sensors integrated into handlebars. Includes, 30 workout programs, HR chest strap, sound system, cooling fan. Tab holder, etc. All the buttons are locked until you activated the treadmill online. Put together all the part required time. What catches our attention of this treadmill if you ask we would say the construction of it? The machine is well built. That is why it’s more smooth and easy to adjust. So that you can efficiently run or walk on it and burn calories without having much muscle ache. And the quickly accessible programs are beneficial in achieving goals like toning the body or lose weight. For many runners or athletes, Proform 905 is a favorite machine for daily practice. 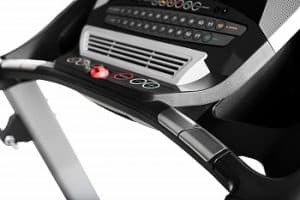 The size of the treadmill is compact, made with quality materials; the finishing is good, and the features are pretty impressive. Yes, the price of this machine is slightly high. You will find many other options in below if its price but not the quality. The running surface of the treadmill is incomparable. It’s smooth, well gripped and sturdy at the same time. So, we hope you find the ProForm 905 CST Treadmill review helpful. If you want to invest in something better we would recommend you to spend on ProForm 905 CST Treadmill. It will be your personal trainer and help you achieve different health goals, keep in shape and fit for the coming years.